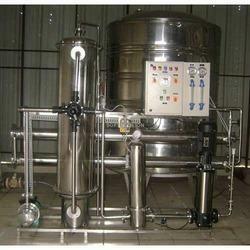 Offering you a complete choice of products which include dosing pump machine, chemical dosing machine and dosing pump. Gained prominence in the industry as a manufacturer, supplier and trader, we are engaged in offering Dosing Pump Machine. Used for various industrial applications, these pumps are manufactured in adherence to the guidelines laid in the industry. After production, these pumps are checked thoroughly on various parameters to ensure flawlessness. Understanding the demands of customers as a manufacturer, supplier and exporter, we are engrossed in offering Chemical Dosing Machine. This equipment is manufactured with the aid of ultra-modern machinery and cutting-edge technology by our team of diligent professionals. Dispatching our range on-time to the customers' premises, we have gathered huge client-base. 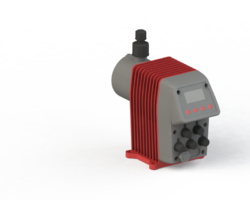 Supported by a team of highly experienced and determined professionals, we are able to manufacture, trade and supply a wide gamut of Dosing Pump. These pumps are designed in adherence to the international quality standards and norms. Moreover, our quality controllers check the offered pump at various quality parameters to ensure a flawless dispatch at the clients' end. 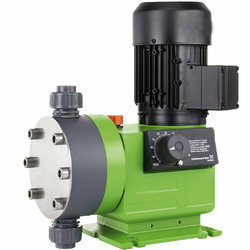 These pumps are widely demanded among our clients due to its attractive features. Capacity of tank 100 Ltr. Application To ensure non-adherence of scale causing salts on the membrane surface by adhering to the crystals of scale causing salts. Not much change in pH value.